I very rarely write about the Cartel Market on here. Even though people frequently complain that Bioware spends too many resources on it (while simultaneously complaining that not enough resources are spent on filling the Cartel packs with new and unique item models, because MMO players are nothing if not conflicted), I can tell you from experience that it's very easy to play the game very intensely without ever even looking at the shop. It's just not needed. Maybe things are different if you are always on the lookout for the newest fashion items, but that's not me. However, yesterday a particular bit of controversy caught my eye. 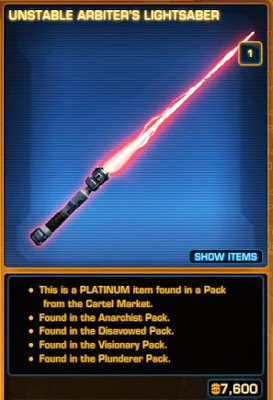 The Unstable Arbiter's Lightsaber (aka the "Kylo Ren Lookalike Lightsaber") is having a limited time stint on the Cartel Market as a direct sale item. While I have no interest in it myself, that seemed nice to me. Previously it was only available as an ultra rare drop from Cartel packs, and people are always complaining about those and saying that they just want to be able to buy the highly sought-after items directly, even if they were expensive. So Bioware has decided to finally give people what they want, at least as an experiment. That's great, right? Apparently not, because... the price! 7600 Cartel Coins come in at about $60 - I haven't done the maths for myself, but considering the prices of different CC bundles, that seems about right. Now, don't get me wrong, I see nothing wrong with people saying that they find this too expensive for what it is. But the sheer outrage accompanying the sentiment surprises me. I happened to click on my general chat tab last night just to be greeted by someone saying that this makes them so angry with EA, they hope that someone bombs their offices. Yeah. People are treating this like some sort of insult or sign of moral failing and I just don't see why. We're not talking about food, medication or some other necessity here, but cosmetic fluff in a video game. The real world is full of stuff like this. You can buy a handbag for $30 or for $3000, without gaining any functionality, and yet I don't see anyone raging that Chanel hangbags are a thing that exists. People like to show off their wealth; it's a thing. "But that's more expensive than many fully-priced other games!" Yes, and instead of buying a Chanel handbag you could buy a used car instead, but do you want to? If you are playing a lot of different games and spending money on a lot of different games, then spending $60 on a single vanity item is probably not an attractive proposition to you. But many MMO players aren't gamers in the traditional sense who buy lots of new releases every month. If SWTOR is all you're playing, you're having a good time with it and are happy to support it financially, this offer might not seem quite so crazy after all. I suppose being the one to raise the prices on the market compared to competitors might cast any dev in a bad light, and I can't think of any other Western MMO that currently charges this much for a single cosmetic item in their cash shop. Though that does remind me of previous PR disasters related to expensive cash shop items. Who could forget EVE Online's "Monoclegate", which was enough to earn the word monocle a special Urban Dictionary entry? Though from what I gathered from reading Wilhelm's blog, that seemed to be less about the item's mere existence and more about CCP threatening to drastically change the game's direction, of which the monocle was but a symptom. Or how about LOTRO's "hobby horse" from 2012? 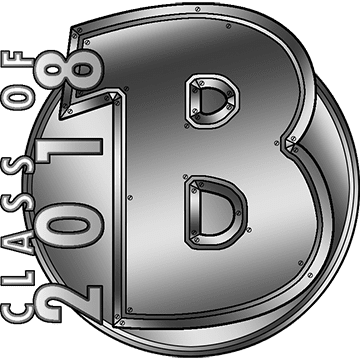 Though again, looking back at that now the annoyance seemed to stem less from the existence of something that expensive and more from it just not being a very desirable item. One thing that makes the Unstable Arbiter's Lightsaber different is that it's not a new item, but something that has been around for a while and actually has a real-world value already. Sure, you can't officially trade real money for credits directly, but you can buy Cartel Coins, buy something from the shop and sell it on the GTN. Looking at the GTN on TRE this morning, I saw Unstable Lightsabers going for about sixty million credits. I compared this to the sale prices of popular cash shop items to re-sell, such as hypercrates and character boosts, and what do you know, you would have to buy and sell about 7000+ CC worth of stuff to earn those sixty million. So basically, people were already able to buy the item for that amount if they wanted, it's just that the supply was limited. But hey, evil Bioware for giving people more of a popular thing I guess. I hope it goes well for them. The timing also seems to have a factor in people's knee-jerk reaction. A common belief surrounds BioWare's 'desperate dependency' on the Cartel Market sales becoming even higher since the Galactic Command debacle to counteract the loss of sub revenue. One item really shouldn't mean the difference between life-and-death of revenue sales, but, hey, one more piece of seemingly-undeniable proof that "this game is dead" to sling onto the years-old pile of undeniable proofs, I guess. Gotta keep those doomsayers busy. Es war für mich überraschend dieses Angebot online zu sehen. Obwohl ich dank "SWTOR TV" meist schon im Vorfeld darüber informiert werde, was in ein paar Wochen im Kartellmarkt erscheinen wird. Nicht das ich ein aktiver Käufer wäre, aber vielleicht lässt sich ja was Schönes günstig im GTN abgreifen. Im ersten Moment dachte ich mir ebenfalls, dass der Direktverkauf eine gute Sache ist. Da sich so viele dieses Lichtschwert gewünscht hatten und es so rar ist. Dann habe ich den Preis gesehen. Naja...wer ist unbedingt haben will, der wird zugreifen. Das Lichtschwert selbst besitze ich durch einen Zufalls-Drop aus dem "ersten" DVL-Event. Ich konnte den Hype darum nie verstehen und war enttäuscht, dass ich es nicht für eine halbe Millarde im GTN verkaufen konnte, da bind-on-pick up. Das jetzige Angebot im Kartellmarkt bewegt mein Gemüt aus genanntem Desinteresse nicht. Ich weiß aber nicht was wäre, wenn ein 60$-Angebot für eine Rüstung kommt, auf die ich schon seit Monaten/Jahren einen Blick geworfen habe. Ein Freund von mir spielt World of Tanks, hat ein stabiles gutes Einkommen und stellt sich ein oder zweimal im Monat für 30-50 Euro einen neuen Panzer in die Garage. Jeder wie er kann und will, und wieviel Bedürfnisse in ihm geweckt werden. Ich kann es nicht nachvollziehen...ob bei diesem Lichtschwert oder bei virtuellen Panzern. Bei Tulak Hords Rüstung, wäre ich aber zumindest am Nachdenken. Die ganze Situation erinnert mich stark daran, als Blizzard for sieben Jahren ihr "Sparklepony" für WoW rausgebracht haben. Damals wurde auch der Preis von $25 als viel zu teuer angesehen (wie sich die Zeiten ändern), und viele waren schockiert, dass trotzdem über 100,000 Leute am ersten Tag eins kaufen wollten. Ein interessanter Artikel, den Du da verlinkt hast. Bei mir ist es genau umgekehrt: Ich hatte nie ein Problem mit dem Abo. Ich sehe das wie eine Clubmitgliedschaft. Man zahlt für gewisse Services and wenn man aufhört zu zahlen, tritt man quasi aus. Aber mit dem Kaufen von virtuellen Gegenständen tue ich mir schwer, weil diese einem Besitz vortäuschen, man aber nicht wirklich etwas in der Hand hat. (Und falls mit dem Spiel eines Tages Schluss ist, ist sowieso alles weg.) Ich weiß oft auch nicht im Voraus wie nützlich das Ding dann wirklich sein wird und habe Schwierigkeiten damit, den Sachen einen Wert zuzuordnen. Der Schlusssatz meines ersten Kommentars lautete damals im März: "Bei Tulak Hords Rüstung, wäre ich aber zumindest am Nachdenken.". Ich war tatsächlich am Überlegen. Habe mich aber gegen einen Kauf mit Echtgeld entschieden. Im GTN war das Set für ein knappes Zeitfenster für ca. 40 Millionen Credits zu haben. Das habe ich aufgrund von Creditmangel leider verpasst. Glücklicherweise fand ich einige Wochen später einen netten Zeitgenossen, der es mir für 30 Millionen verkaufte. Nun bin ich also im Besitz eines Sets, von dem ich meinte, es zu begehren. Es liegt seit einigen Tagen in meiner Frachtrampe, sieht bei genauerer Betrachtung gar nicht sooo toll aus, und ich versuche einen Käufer zu finden. 60 Millionen würden mir schon reichen. Oh Gott...jetzt bin ich durch das Lesen deines aktuellen Beitrags doch wieder hier gelandet und muss schmunzeln. Das Tulak Hord Set. Ich konnte es damals tatsächlich für 70 Millionen wieder verkaufen. Heute sind die Preise im GTN ins Bodenlose gefallen. Ich habe es vor zwei Wochen für 10 Millionen oder so wieder einmal gekauft. Diesmal aber mit der Intention es für einen Char zu nutzen. Nach so langer Zeit bin ich immer noch hier. Du machst einen hervorragenden Job...jede Woche lesenswerte Artikel. Danke.